In the 1890s the fight game was changing. The prize-fighters and bare-knuckle brawlers were disappearing as the new “scientific” boxers emerged to fight under the Marquis of Queensberry rules. Irishman Tom Sharkey was the never-say-die fighter who bridged the gap between old and new. 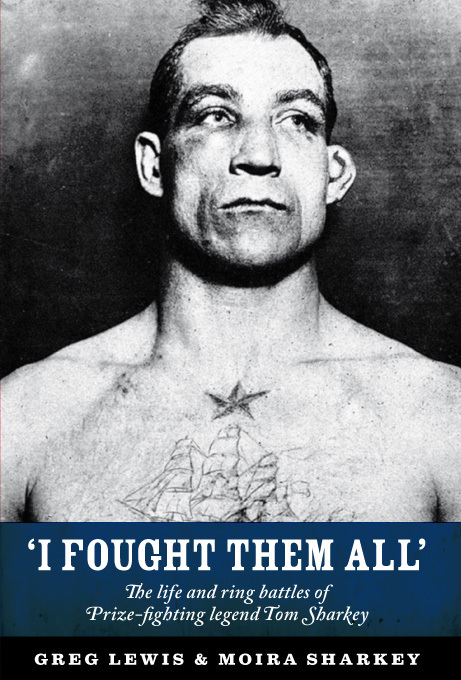 Within a short time of arriving in America he took on all the top boxers of his day: his hero John L Sullivan, Gentleman Jim Corbett, Bob Fitzsimmons and the man who would become not only his greatest foe but his best friend, Jim Jeffries. Their 25-round world title fight at Coney Island was one of the most gruelling and compelling encounters ever seen inside a ring. I Fought Them All prints the fact and the legend, and is chocked full of the rich characters who dominated the sport and politics of the period, from Wild West gunman Wyatt Earp to Tim “Dry Dollar” Sullivan of New York’s Tammany Hall. It is the story of an Irish immigrant, a sporting celebrity who won and lost a fortune, and of a man described by the New York Times as a “ring immortal”. Great article in the current issue of the Irish Emigrant – an excellent website for Irish communities around the world – about Magic Rat Books’ brand new biography of boxing legend Tom Sharkey. ‘The colorful life and times of one of Ireland’s forgotten sporting heroes is revealed in I Fought Them All, a new biography by Greg Lewis and Moira Sharkey,’ writes the website and magazine. ‘”Sailor” Tom Sharkey, whom the New York Times once described as a “ring immortal,” fought the first four heavyweight champions under the Marquis of Queensberry rules – becoming a boxing legend and a very wealthy man in the process. Our family (Sharkey) would like to buy the book (hard copy). Amazon.ca and Amazon.com are sold out. Thank you. I’m very sorry but the only version of the book currently available is the e-book on Kindle. There may well be another print run of the hardback, or a paperback, in the future but probably not for some time. I hope the Kindle version may be of some use.